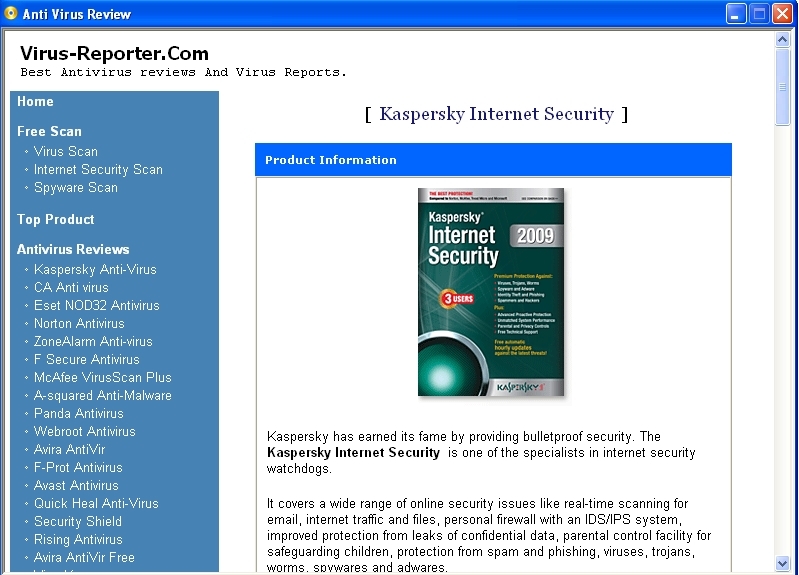 Kaspersky Internet Security Review brings you consumer ratings on Kaspersky Internet Security. Thus, here we share important facts, relevant points as well as unfiltered consumer-comments. Kaspersky Anti-Virus Review brings you consumer ratings. Protect your computer from viruses, malicious programs, hackers and spam. Qweas is providing links to Kaspersky Internet Security Review 3.0 as a courtesy, and makes no representations regarding Kaspersky Internet Security Review or any other applications or any information related thereto. Any questions, complaints or claims regarding this application Kaspersky Internet Security Review 3.0 must be directed to the appropriate software vendor. You may click the publisher link of Kaspersky Internet Security Review on the top of this page to get more details about the vendor.